Since I'm new to town (and the state) there's always something to admire and discover by taking a drive around the scenic county roads. such as clear streams with rocks instead of mud! An imaginative auto shop. That's the trunk of an old Chevy over the door. As we were driving along I saw what looked like at first glance like a miniature ferris wheel embedded in the ground. Too bad we couldn't climb over the fence to explore, but there were No Trespassing signs so we just admired the old mill from across the field. All that appears to be left of the stone base is this corner. 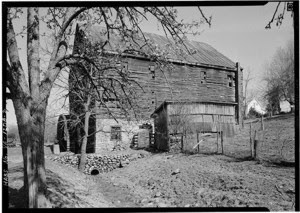 Curious to know more, I did a little "Googling" and found that the remains are of Miller's Mill which was built around 1816. 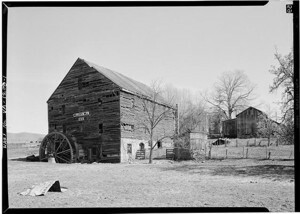 Even though the siding is falling off, the roof is still intact and the mill race is clear so it may have still been in use when these were taken. 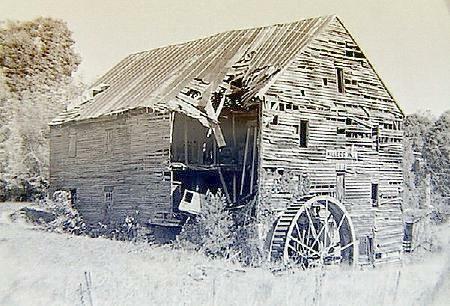 From another source, this shot is from 1979.... obviously no longer in use. Photo courtesy of the USGenWeb Archives Project Originally contributed by Gill Pollard. There was still a large heap of wood and tin behind the wheel area so it looks like it was left to slowly crumble over the years. Finally for those of you who are bird watchers, the variety of avian life in the area is quite striking! Here are a few tropical species (and subspecies) that I wouldn't have expected to see wintering here in the Shenandoah Valley. I may need to get an updated Field Guide. The windows arrived this week! The installation is finished along the front and sides and almost through along the rear of the house. We decided to go a bit overboard and we chose to use Loewen for the windows and all of the glass doors. Made in Canada (wish we could have gone US made, but we didn't feel that we were seeing the same quality in the Marvin and Pella). They've got a straight grain fir on the interior and clad on the exterior. Since we're staining all of the interior wood that fir should be beautiful! I agonized a bit (OK a lot!) over the exterior color choice and decided to be slightly edgy with a dark graphite. The stairwell window is 6' square, so we were relieved to see that they built a platform to help them with the installation! The casement on the left isn't installed yet, but this is the kitchen sink view. I'm excited beyond belief to realize that on a clear day, I can see the top of the Blue Ridge Mountains peeking up in the distance!! It was a major hit to the budget to go with Loewen and our builder had never used them before so we have been holding our breath hoping that our decision was a good one. We were relieved that the comments from the crew were all positive regarding the quality, the heft and the squareness of everything they've installed so far. They'll be a royal pain to design the layout around, but I love the little casements in the master closet! I'm almost ready to gush over how glad I am that we took the Loewen plunge, BUT we've got a problem with the grills on ALL of the doors (5 different openings); the grills (muntins) are about 6" too high and so don't line up with the grills on the windows. We're waiting to see how either Loewen or the distributor in Charlottesville handles it, so I'm trying to reserve my initial enthusiasm a bit until after we see what plan they come up to make it right and how quickly customer service tries to remedy the error. Since I'm the one who was making the biggest push to use Loewen, largely because of the quality we'd get in the doors, I'll either be singing their praises or knocking myself in the side of the head! Once again it seems as though we'll be lucky enough to have wonderful neighbors surrounding our home. Maybe similar minds flock to similar places? Our former neighbors in Lake Jolie Vue are irreplaceable but I remind myself that I'm not trying to replace anyone. Shifting categories from "friend and neighbor" to just "friend" doesn't mean that anyone left behind is less loved or missed. We've felt welcomed on our new road since shortly after we bought the land two years ago. Since then we've gotten to know all but one of the homeowners on the road (there are seven total) and we've shared a meal or long visit with many of them. Our "southside" neighbors, Brenda and Clay have been nice enough to invite us for coffee several times on previous visits and they asked us over for dinner a little over a week ago. At the time were still unpacking and so it was a VERY welcome break. Plus they also invited neighbor Betty whom I enjoyed getting to know better. Can I admit that it was also a nice change to carry on a sustained conversation with someone other than Joe?! We've done a few things separately since that evening, but at the time we were seemingly joined at the hip and hadn't been apart in days. If I had remembered to bring the camera, there might be photos here of the perfectly grilled salmon and steak or the smile on my face. It was a fun evening and helped us feel less like newcomers and more like part of the town. Neighbors Linda and Dave are right across the road from the new house and on Thursday of this week, I finally got to attend one of the concerts that they host at their home on a regular basis. This is the view of the Blue Ridge Mtns looking east from their driveway! No photoshopping here... I couldn't do it justice anyway, it's so much more beautiful in person than my point and shoot can capture. Plus there are 360 degree views like this all the way around from atop their 50 acres. Even by Rockbridge County standards (there are views everywhere! ), it's a jawdropping sight. Dave and Linda hold regular "house concerts" and "house music parties" in their "concert room". It's hard to explain the atmosphere of relaxation and community that comes across when you're there. Irish guitarist Tom Martin was the guest artist on Thursday and as I listened to him sing and fingerpick his guitar (imagine a combination of John Prine and Albert King with an Irish accent), I kept picturing myself being able to tootle across the gravel lane to such concerts on a regular basis when the house is completed. Friendly neighbors with interesting stories and lives ...... Ah yes! Twenty six years later, we've picked another splendid road on which to build a house! It's quite a kick being able to get such a variety of local goods. Considering that the county is only 35K total, there is a lot of diversity in what's available. This was the haul from my visit to the Farmer's Market last week; all produced and grown nearby and most of it organic! Noel had to check it all out as I was unloading, but alas no cans of cat food! The title of this post is land of milk and honey, but I already had a jar of honey so didn't need to buy any this week. I admit to being a little crazy about cooking. The back wall of the den looks much less open now that the fireplace is in!! It'll be covered with stacked ledgestone (manmade or "cultured" stone), the hearth will be soapstone. To get a sense of scale, the bolts coming out of the masonry that will eventually hold the mantel are a little higher than 6'..... it's not quite a Cracker Barrel fireplace, but it's pretty big! And the fireplace on the outside lower level is also finished! The timbers for the rear porch have been delivered but for now it looks strange with the roof just ending back there and doors to nowhere! When the Louisiana house sale went through, we gave the okay to continue work on the garage. The foundation walls were poured at the same time as the house, but we had stopped work figuring that we could easily do without the garage. But since I love the design (architecturally it's more striking than the house from the front) and since Bernard the Mini would love to be "inside", I'm glad that we move ahead with it. The garage is oriented at a 45 degree angle from the house. We'll have a walkway but aren't sure whether we'll cover it or do an arbor type of connection. I'm standing on the gravel lane taking this photo... they're ready for the slab, but rain over the next day or two might slow that down. The front view.... forms going up for the front porch. Or from the back did you catch what was a little strange? What doesn't quite add up? There are two fireplaces and three flues! The real flues are the two on the right.... the dummy flue on the left was suggested by the stone mason as a way to balance the look since he couldn't center the flues in the chimney! We knew that one had to be centered and one on the right and we had never thought about filling the void with a false flue.... Genius!! The chimney and stone around the flues will eventually come up to the level of the concrete on the dummy flue and will have a band detail. Again for a sense of scale... they are monster flues! Another milestone..... the windows and doors were delivered today!